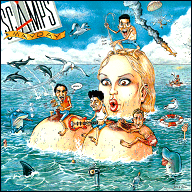 The Scamps - a French Rock'n'roll/Rockabilly outfit. This album was recorded in 1990 at Studio Ketchup, Le Havre, France apart from 'Play man' which was recorded at E.M.S. Musik Studio, Spengel, RFA. Life is not so fine (Peisey/Lagnier) * Luscious (Hall) Cop. Cont.